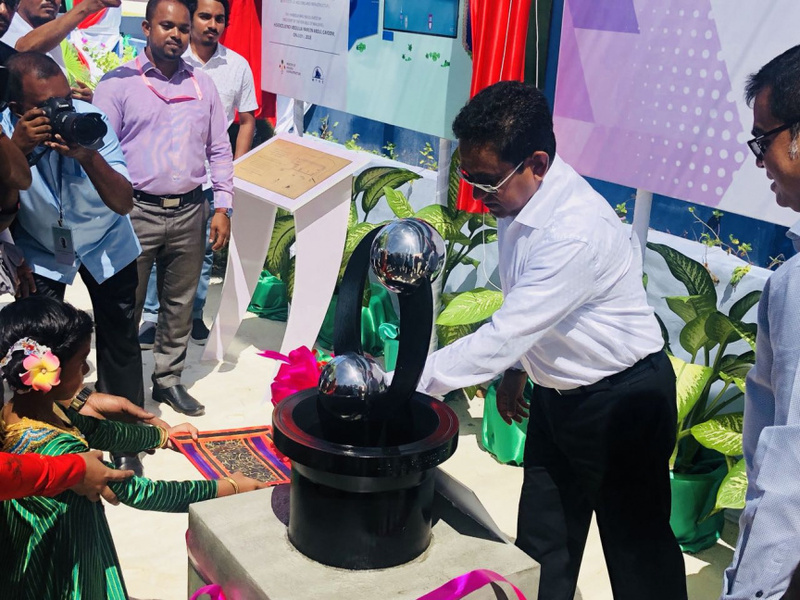 Maldivian President Abdulla Yameen Abdul Gayoom has inaugurated sanitation services and the harbor developed in M. Dhiggaru. Yameen visited Dhiggaru this Tuesday morning as part of his two-day tour of several islands in M. Atoll. Construction of the sanitation system in Dhiggaru was contracted to Male’ Water and Sewerage Company (MWSC) by Ministry of Environment and Energy for MVR 26,577,851.08. Construction began on January 18, 2017 and was completed on January 13, 2018. The project was contracted to MWSC under direct negotiation, on a design and build basis. The sanitation system in Dhiggaru includes a 4.3-kilometer sewerage network, two pump stations and 340-meter outflow pipe to service 249 households on the island. Meanwhile, the Dhiggaru Harbor was contracted to Maldives Transport and Contracting Company (MTCC) for MVR 49 million. The harbor stretches 750 feet long and 260 feet wide. It also has a 452-meter seawall and 23-meter revetment. The contract between Maldivian government and MTCC for the Dhiggaru Harbor was signed in 2015. And the project was completed in August, 2017.